Nigerian Shuku Shuku is a great Nigerian delicacy that doubles as a dessert and a snack. 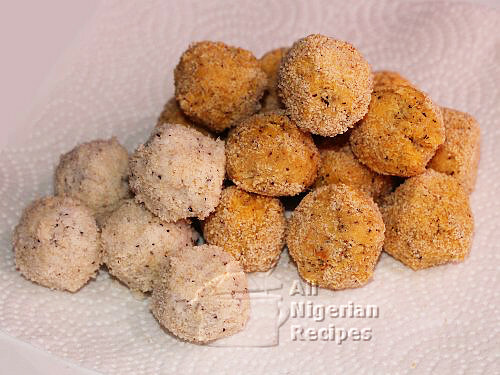 It is one of the easiest Nigerian recipes on this website. If you have ever tasted coconut and bread (chewed together), that's what Shuku Shuku tastes like. It is the perfect way to recycle the chaff that I get when I extract coconut milk. You can also use coconut flakes for this but the Shuku Shuku made with those are lighter. I prepare Shuku Shuku in 2 ways. The first one (shown on the right in the image above) requires baking while the second does not. I prefer coconut chaff for Shuku Shuku because coconut flakes are too light and dry. You get coconut chaff from blending coconuts when making coconut milk and coconut oil. You only need enough quantity of evaporated milk that will make the coconut chaff stick together. So just keep adding bit by bit till the chaff is sticky enough to make balls, it should not be soaking wet. You can also use condensed milk. I do not use it because it is too sweet for me and it is kind of sticky. Put the coconut chaff in a deep bowl and add the egg yolks and the icing (powdered) sugar. Mix very well with a spatula till everything is well incorporated. Use fingertips to make small balls of Shuku Shuku, about the size of table tennis balls. Gently roll each ball on some bread crumbs till it is completely covered with bread crumbs. Place in the oven tray and bake in a preheated oven at 170°C (335°F) for 15-20 minutes. Or till you see them turn a slight yellow all over. Put the coconut chaff in a deep bowl and add the icing (powdered) sugar. 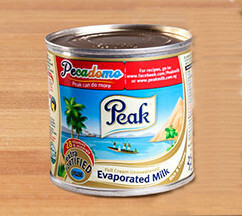 Add the evaporated milk (or condensed milk) bit by bit and mix with a fork at the same time. Mix very well with the fork till everything is well incorporated. Use your finger tips to make small balls of Shuku Shuku, about the size of table tennis balls. Gently roll them on some bread crumbs till they are completely covered. Serve as dessert or with any chilled Nigerian drink: Zobo, Soy Milk, Chapman, all the Kununs!